In early August, I predicted who I thought should get the second alternate and the possible candidates. I had the expected Max Talbot, Petr Sykora, Brooks Orpik and Ryan Whitney. But I also included Evgeni Malkin, not expecting him to get it at all but to throw it out there because some thought he would get it. I giggled at the thought of ‘Geno ever getting the second ‘A’ because the dude can barely speak English. So if he can’t speak English, he can’t communicate with other teammates as well. I thought that was a big deal right? Rob Rossi of the Pittsburgh Tribune-Review recently wrote an article suspecting that #71 would get the second ‘A’. Talk about a TOTAL SHOCK. I would have to think that Malkin would be the one of the more least likely players to receive that honor. Usually a great teammate/role player like Talbot gets it or an old, veteran guy like Sykora would get it. But to give it to someone who can barely speak English, is only 22 years old is surprising and only been in the league for two years is surprising. However, I like it but at the same time I don’t like it. 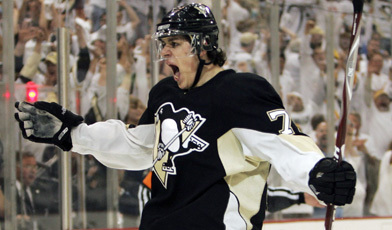 Why I like it…’Geno will be here for 6 more seasons since he just signed a 5 year contract with the Pens. What a great way to tell him he’s a big piece in this organization by putting an ‘A’ above the skating Penguins logo. Since Crosby gets most of the media attention, it wouldn’t surprise me if Malkin sort of feels neglected because he’s on the same level as him but doesn’t get any where close to Crosby’s star level. Like I said before, it’d be a great message to ‘Geno that the Pens organization is committed to him as much as they are to Crosby. Add that it could give him confidence. It could give him the mindset that he’s one of the team leaders and make him work harder. Sometimes a boost in a player makes them play unreal (which is a scary thought since we’re talking about Evgeni freakin’ Malkin). Why I don’t like it…he can’t speak English. Yes I’ve said it a couple times now but it’s important. If Malkin can’t speak English, he won’t be able to technically ‘lead’ this team. Yes I know that some players lead by example but when you’ve got to order someone to step up, you can’t do it when you’re speaking Russian. When it’s less than two minutes to go in the third period and you need a goal to tie it up, you can’t be motivating them in Russian. In order for Malkin to get the second alternate, he should speak the English language a bit more fluently. When pressure is put on some athlete’s shoulders they thrive while others die. I’m afraid ‘Geno could be one of the fragile ones which will make his play worse. That’s definitely not something I nor any other Pens fans want. This entry was posted on September 23, 2008 at 10:00 pm and is filed under 2008/2009 Penguins, Penguins Articles, Penguins Rants. You can follow any responses to this entry through the RSS 2.0 feed. You can leave a response, or trackback from your own site. Ill be honest, I felt exactly the same way you do about Gino getting the ‘A’ this year… i thought it was too soon because of the language barrier. That was until I checked out some of the clips on PENStv on pittsburghpenguins.com. One of the clips is a Q&A with Steigy and Malkin from the Pens Town Hall Meeting last week. I was shocked at how much Malkin’s English has improved. I heard teammates mention how well he understood the language last season, but now it seems he is learning to speak it very well rather quickly. I just now watched that and I gotta say I’m pretty impressed. Last season he couldn’t spick a lick of English. I’m not trying to say I wouldn’t be content with Malkin getting the second ‘A’. I just feel like next year should be the year he gets it. For this year, give it to Talbot or Sykora or someone like that. But I do gotta admit, I’m impressed by his progress and pleased with it. I totally agree with you. I think Max or Sykie should get the other A this year. But, with the uncertain nature of Gonchar’s injury now looming ahead of us, we might be looking at 2 vacant ‘A’s on opening night. Also, back on the topic of Malkin’s English… I wonder what happened to George the Interpreter? That guy was clutch. What no one seems to ask is: Does Malkin want the ‘A’? Every interview of Malkin about taking on more titular responsibility has him responding with a shocked ‘No!’. I remember the interview after Crosby went down last season where Steiggy suggested facitously that Crosby could be traded and make the Pens Malkin’s team, and the shocked and frightened look on Malkins face. Same thing with the ‘A’ if you read the whole article. I think what we’re dealing with is a young man who’s incredibly good at his job, but doesn’t do well trusting his leadership ability. The exact opposite of Jagr, who didn’t have the ability, but wanted the position, Malkin has the ability to lead the team in any role he’s called on to do it, but doesn’t seem to think he’s good enough for the importance of the position. We want happy fantastically talented hockey players around here people! And Malkin’s going to be around for a while. Let’s let his confidence grow into his ability and not just slap the ‘A’ on him because that’s what we want. Also, I think his English is MUCH better than he shows it, he’s just self concious about it. You make a very good point with Malkin possibly not wanting the second ‘A’. I’ve noticed he usually shies away from the cameras.